After two years, The Overnightscape is back. In that time, I kept doing essentially the same show – but under a variety of different names: The Rampler, The Rampler on WFMU, The Frank Nora Show, etc. The Overnightscape began in March 2003 – long before the dawn of “podcasting”. When podcasting took off in October 2004, I jumped aboard, and it was an intoxicating ride. I started doing the show daily in January 2005. That year, podcasting was hot, and I thought I had finally made it. Listenership was increasing, and the Podcast Expo in California later that year was very exciting. However, the whole podcasting phenomenon cooled off in 2006 – especially for independent podcasters like myself. The Podcast Expo a year later in 2006 was quite depressing for me, and I stopped the daily format of The Overnightscape, returning to a weekly format. In early 2007, I set forth on a new project – ABM Show, with my old college buddy Mad Mike. Unfortunately, this project collapsed after a few months. I kept doing The Overnightscape, but with less of a sense of direction. 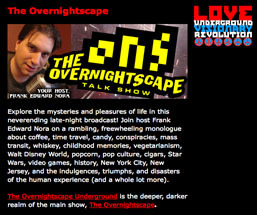 In December 2007, I started The Overnightscape Underground, to explore new vistas of Internet night radio. This was the first of many splits which eventually led to the end of the show called The Overnightscape. In August 2008, I was experimenting with recording on the street of NYC, on my commute into work. While this could have simply been a new format for The Overnightscape, I decided to give it a new name – The Rampler. The Rampler took off almost immediately, and the show became intertwined with an online phenomenon called Andy Kaufman Lives. Through this connection, I was contacted by a prestigious “freeform” radio stationed called WFMU. Starting in early 2009, I began doing some shows on WFMU, and by the Summer, I was on the schedule, with The Rampler on WFMU. It was another exciting time, and I thought that this time my “radio career” was going to take off. 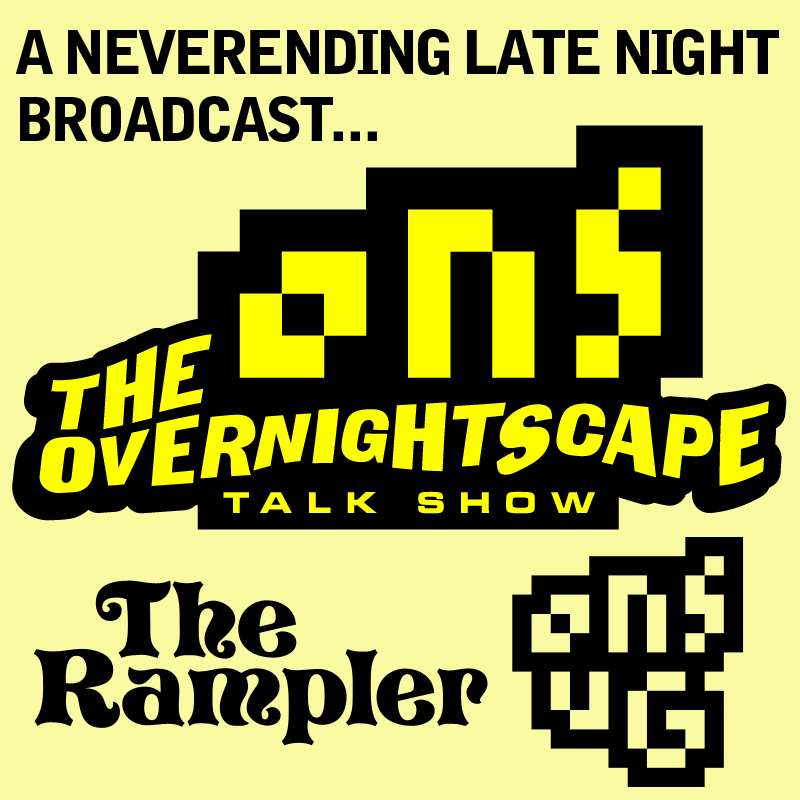 By early September 2009, I decided I should put and end to The Overnightscape and The Rampler, in order to focus on The Rampler on WFMU. Unfortunately, after 16 weeks, WFMU cancelled my show. I was still doing my “ug” show on The Overnightscape Underground – but in October 2009 I took a “radio vacation” and really thought about quitting the whole thing. After all the effort, after all the highs and lows, I felt I was nowhere again. But, I came back in November 2009 and continued doing the “ug” show on The Overnightscape Underground. In retrospect, I should have just brought The Overnightscape back then – but I was still reeling from all the chaos. Then, something amazing happened – many of the people who had been listening to my shows decided to start doing shows of their own, and I put these shows on The Overnightscape Underground. As 2010 dawned, a new phenomenon was growing. I had inspired a number of people to try out this monologue “night radio” format – and I was running a cool little Internet radio experiment. I thought that with all these new people involved, with all the people they knew, and with all the collective effort that could be put into it, that The Overnightscape Underground was destined to grow into something very cool. I changed the name of my show to The Frank Nora show, and the whole thing grew by leaps and bounds in April 2010. It was another very exciting time. But, as 2010 wore on, once again it became clear that things were cooling. By the Fall of 2010, I was struggling to find new ways to structure things so that we could warm things up again. I had tons of different ideas, but none of them seemed right. In recent months, I started feeling burnt out again, and The Overnightscape Underground began to really cool down. A few weeks ago, I decided to switch to a weekly format, and changed The Frank Nora Show to The Rampler Weekly. I did three episodes of The Rampler Weekly – but then it came to me – I should just return to the original – I should bring back The Overnightscape. Looking back on things, I had six years of The Overnightscape, and then two years of confusing (yet also wonderful) chaos. So in returning back to the main show, I am bringing to it a wealth of experience from those two crazy years. The new format for The Overnightscape is a little different from the old show. I’ll be doing a new show each week or so – and I’m thinking each show will average about four hours. But instead of releasing each episode in one chunk, I’m going to release it in individual segments. The first new show, number 782, has eight separate segments, and totals about 4.5 hours. Each show will be mainly my usual monologue format, but then later in the show things will shift to more of an audio exploration – with lots of music, old recordings, weirdness, and whatever else I feel like doing. The show will be released as segments here on TheOvernightscape.com. The full shows will also be available for download here. The Overnightscape Underground – at onsug.com – will continue, but I will not be posting The Overnightscape there, since it doesn’t make sense to double-post the show. However, I will continue doing segments on Overnightscape Central on onsug.com – and I expect that The Overnightscape Underground will continue to grow and evolve with the many talented people doing shows on there. So what does the future hold? I really don’t know – but I still love doing The Overnightscape, and I hope that with this reorientation things can continue to move forward in a bit of a more stable way. The Internet and culture as a whole is going through ever more changes all the time. I hope that The Overnightscape and The Overnightscape Underground can grow and take their place in the vast and evolving landscapes that are developing. I will be on the air on WFMU for the third time, tomorrow night/Sat. morning (4/25/09) from 2:00 AM to 6:00 AM, New Jersey time. I will be filling in for “Zzzzzzero Hour with Bill Mac”. Though it was a bit tricky last time, I do plan on taking phone calls again, at some point during the show. Amazing. Absolutely amazing. This is one of the coolest things anyone has ever done. A video all about The Rampler by Andrea from Croatia. It makes me happy!! I know I haven’t been doing too many episodes of The Overnightscape lately (more are coming soon)… but there’s a LOT of new stuff on The Overnightscape Underground One feature that I’m really excited about is “The Motor Excursion Ruffians #2”. It’s a road trip with my friend Peter down to Virginia, where we meet up with our friend Bryan. 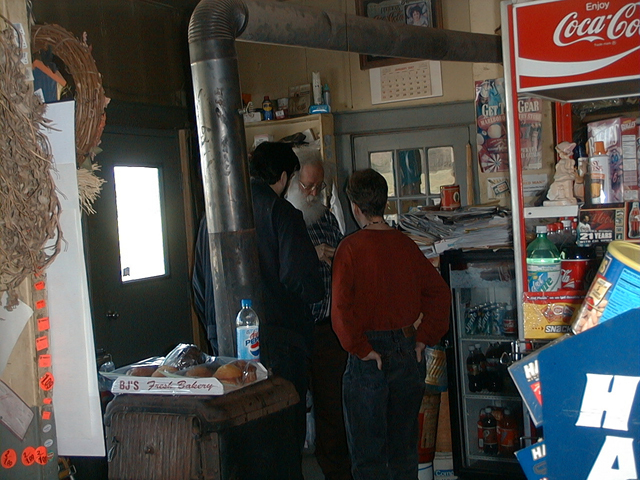 It was recorded on April 4-5, 2003 – right at the start of The Overnightscape (between episodes 4 and 5). The crazy thing is, this 9-part, 8.5 hour show has never been heard by anyone – until now! I don’t know why it took me so long, but after nearly 6 years, it is finally available for you to listen to! Here is Part 1. And you can find all 9 parts here. Plus, here a photo gallery of pictures from the adventure. The Overnightscape Underground – Day 5 is complete! The Overnightscape Underground – Day 5 is complete! Check it out! I mentioned on The Overnightscape Underground that I was going to be voting for Frank Moore for president. He heard the show and contacted me, thanking me for my support. He also mentioned the idea of adding The Overnightscape to the lineup of his Internet Radio Station, Luver.com (Love Underground Visionary Revolution). I thought it was a great idea. So, The Overnightscape will now air on Luver 9:30pm-11:30pm on Fridays (Pacific Time). Check this page for info on how to tune in.